Altabira City Tavern is teaming up with Ninkasi Brewing Company to bring us a seasonal craft beer dinner on Wednesday, September 20th. Last fall, I had the opportunity to attend a similar beer dinner at Altabira, created by Chef Luis Escorcia. You can read about it and see pictures of the beautiful (and delicious) dishes here! There are only 25 seats available for the dinner, so take a look at the tantalizing menu below and make your reservations! PORTLAND, Ore. Altabira City Tavern welcomes Ninkasi Brewing Company from Eugene, Oregon, to its first seasonal craft beer dinner on Wednesday, September 20th. Guests will enjoy a four-course menu paired with craft beers from Ninkasi and prepared by chef de cuisine Luis Escorcia and pastry chef Natalie Harkness. $50 per person includes beer and food. Gratuity not included. Reservations available by calling Altabira at (503) 963-3600. Paired with Helles Belles Lager, a light, flavorful lager that strikes a balance between satisfyingly crisp and deliciously crafted. Paired with Dawn of the Red, bursting with tropical notes with the bright complexity of El Dorado and Mosaic hops. An assertive hop presence is carried by a subtle caramel backbone, creating a flavorful, juicy beer. Paired with Pacific Rain, a fiercely flavorful and refreshingly drinkable beer crafted with water from Oregon’s McKenzie River and a band of four distinguished hops. This Northwest Pale is citrusy, crisp and tailor-made for easy drinking. Paired with Oktoberfest, crafted with Oregon-grown hops married to Northwest ingredients with a traditional German style. This light-bodied beer celebrates the harvest with a toasty malt bouquet and a touch of hop bitterness. Prost! Paired with Vanilla Oatis, a divine blend of vanilla, coffee, chocolate and roasted malt notes swirled together to create a crisp finish. The true signature of this beer comes from adding whole vanilla beans to the final stage of conditioning – the process used to dry hop a beer. This oatmeal stout is slightly sweet with a rich complexity and is decadent and delicious. 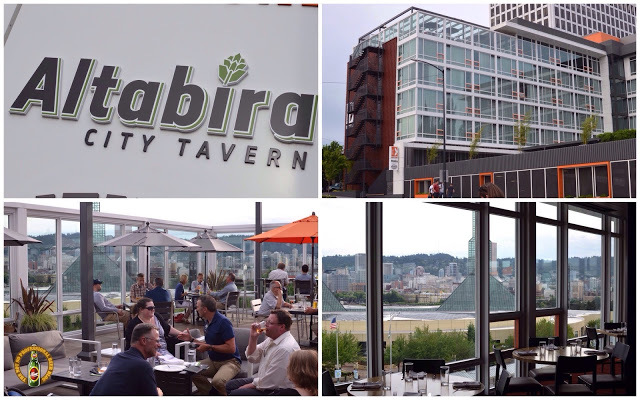 Altabira City Tavern offers regional American cuisine focused on updated classic dishes with 16 taps of local craft beers, select Northwest wines and locally distilled spirits. The restaurant and bar is open for lunch and dinner in a modern setting with large floor-to-ceiling windows with sweeping views of Portland’s downtown skyline and inner eastside. For more information and menu, please visit www.altabira.com.